Learn essential hand embroidery and beading techniques using threads, beads and sequins, before beginning your own CRM inspired design. Includes a tour of the Charles Rennie Mackintosh: Making the Glasgow Style exhibition. Famous lovers of eras-gone-by traditionally exchanged embroidered handkerchiefs as tokens of friendship and love. Together with Anthropologie Chloe is bringing the tradition back with a Valentine’s Day-themed sewing workshop. Working with a variety of materials, including colourful threads, shimmering sequins, Swarovski crystals and seductive silks, in this workshop you will create a personalised stitched message or monogram piece for you or your Valentine. Book your place for the 11:00 session here & the 13:30 session here. A two day event where you will be introduced to the exciting workd of surface design at Dundee's Art Contemporary Arts Centre. Learn a variety of beginners stitches and embellishment techniques before learning how to create a versatile embroidered motif that can be applied to any piece of clothing or item. 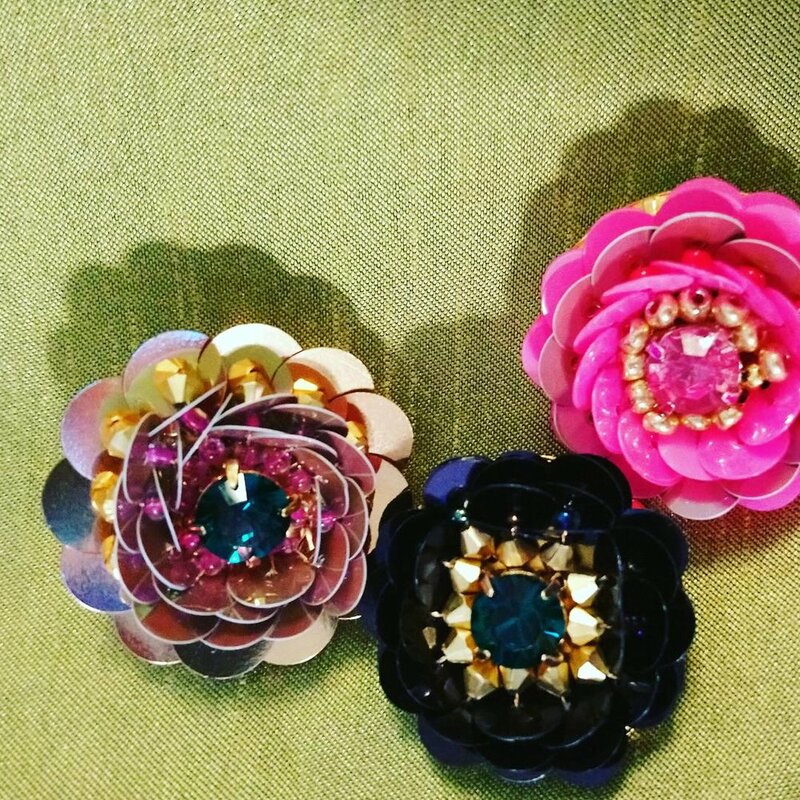 A short evening workshop where you will enjoy learning how to create a 3d sequin flower embroidered brooch. Using a needle and thread in combination with a gold plated brooch backing you will quickly and effectively make a very stylish brooch, which is perfect as a Christmas gift. On completeion of this workshop you will leave with a gold plated hand embroidered brooch using your own colour and bead choices to make your design even more special. A one day course where you will learn how to hand embroider with beads and sequins before working on an existing design pre-planned out by Chloe. You will also have the choice to turn your embroidered design into a unique Christmas Hoop Decoration to hang on your tree or give as a gift. Techniques learned and practiced will be sewing beads and sequins, 3d beading and combing beads with traditional stitch. You will enjoy all of the above in the beautiful and fascinating surroundings of the Wemyss School of Needlework, Coaltown of Wemyss, Fife. The Sunflower design that will be re-worked for the workshop is an historic design from the archive available at Wemyss School of Needlework Museum. Using contemporary techniques and styling in combination with the historic settings and archive design will be sure to create a unique and memorable day. COURSE PRICE: £84.00 - Price includes all materials and lunch. This fun and unique short course will be taking place during Scotland Re:Designed's Hypermarket, looking at 3d embellishment using beads and sequins. On completion of this course, you will have learned contemporary embellishment techniques including sewing sequins and beads, 3d beading and formed sequin flowers that will give impact and texture. You will also have time to work on your own freestyle design. A one day embellishment course where you will be introduced to the exciting world of surface design using beads, sequins and foils. Techniques learned will include sewing beads and sequins, couching, French knots, Bullion stitch, 3d beading and foil. On completion of this course, you will have learned many different contemporary embellishment techniques that will give impact and texture. A one day hand embroidery course where you will learn to create 3d embroidery techniques. Techniques learned will be based on traditional crewel embroidery stitches and will include Stump and Turkey Work using thread. Both stitches will give your embroideries high impact, volume and texture.